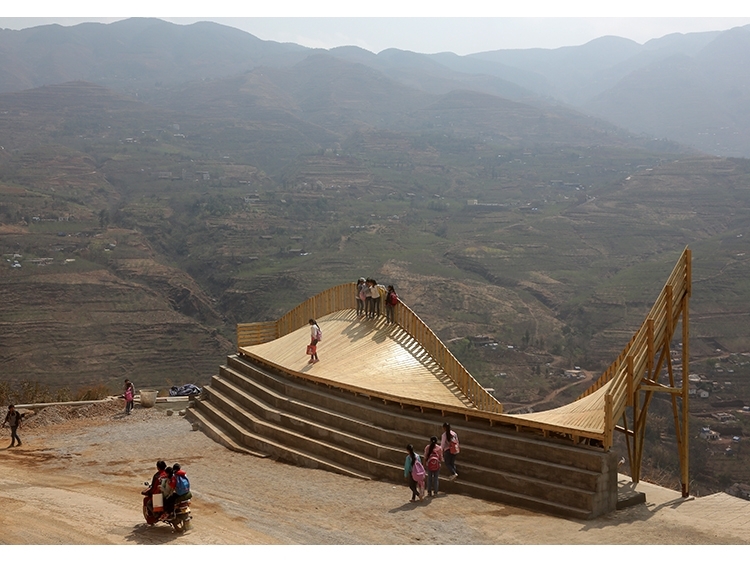 THE WARP is a rest area and roadside market built as part of a post-earthquake reconstruction in Ludian town, Yunnan, China. Situated in an ethnically diverse region with a Muslim majority population, the project serves as a meeting point and look out along the main entry road to this mountain village. The project provides three key spaces, stepped seating area for selling fruit and produce, a wooden deck for viewing and a covered resting and eating area. Formally, the deck extends toward the scenic valley, transforming from a straight line into a sine curve. Its peaks and valleys mimic the landscape while providing two mirrored spaces (above and below) for viewing and resting. This is the third and final instalment in a series of timber projects for Yunnan Province: THE PINCH, THE SWEEP AND THE WARP. It is an exploration of low-cost timber construction in collaboration with a local timber workshop. Each project responds directly to its given site, trying to make best use of a single small structure to provide a maximum of community functions. Collectively the series explores the activities of buying and selling, bridging, resting, viewing, eating, reading, and playing. THE WARP was built with the help of first year architecture students at The University of Hong Kong and funded through a Knowledge Exchange Grant and the Gallant Ho Experiential Learning Fund. Construction: Kunming Dianmuju Shangmao Company Ltd.